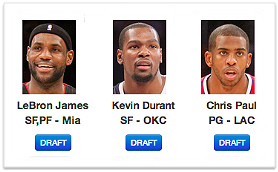 One of the best ways to prepare for you fantasy basketball draft is to conduct several mock drafts. By using this Mock Draft Simulator (powered by FantasyPros), you can complete a mock draft in a matter of minutes. For me, the biggest drawback of doing mock drafts on some of the major sites aside from the time needed to complete a mock draft was the fact that there always seems to be at least one drafter who selects players that make no sense. Someone thinks it's funny to take Brian Scalabrine in the second round and the mock results instantly become worthless. With the simulator, you won't have that problem. Use the mock draft simulator below to heart's content and take the first step toward building your championship team(s).